The city of St. Petersburg, formerly Leningrad, was considered the birthplace of the revolution and a symbol of Russian culture, if we add that during the Second World War there was located the only factory in the world that produced tanks, cars and armored trains. It was enough reason for Hitler to have it as one of his preferred targets. Between September 8, 1941 and January 27, 1944 the city was subjected to a blockade by Nazi Germany, costing the lives of more than 1.2 million people who perished mostly from starvation. In January 1943 the blockade was broken, although it was not fully released until a year later. 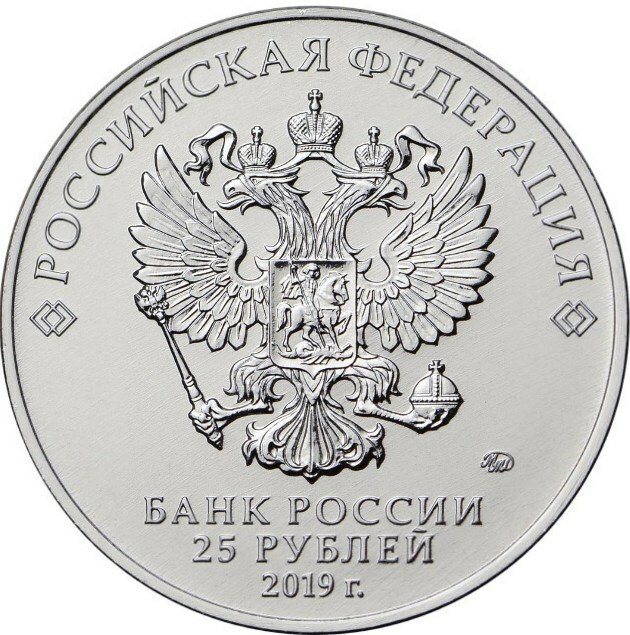 To celebrate the "75th anniversary of the total liberation of Leningrad from the Nazi blockade," the Bank of Russia issues a currency of 25 rubles on January 9, with liberal power in the country. 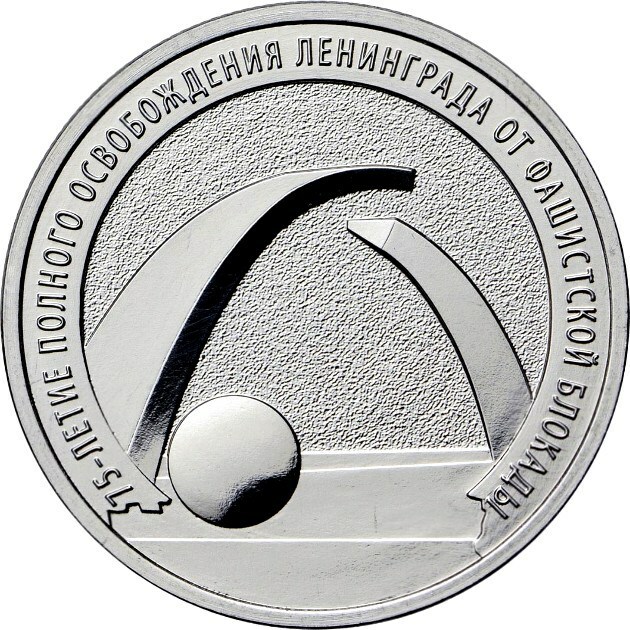 The reverse of the coin presents an image in relief of the monument The Broken Ring with the semicircular inscription: '75 -ЛЕТИЕ ПОЛНОГО ОСВОБОЖДЕНИЯ ЛЕНИНГРАДА ОТ ФАШИСТСКОЙ БЛОКАДЫ '(75th anniversary of the total liberation of Leningrad from the Nazi blockade). The monument ' The Broken Ring ' dates back to the blockade of Leningrad when the only possibility of carrying supplies was through the Lake of Ladoga, covered by ice. This route was called ' the way of life ' . For many survivors those hard and terrible years the memorial ' The Broken Ring ' became the symbol of this road. Work of the sculptor Konstantin Simún contains two reinforced concrete coffers that symbolize the ring of the blockade and the rupture between them, ' The Way of Life '. 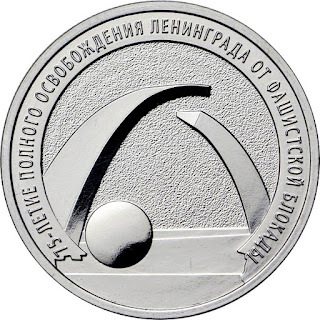 The obverse of the coin shows a relief image of the coat of arms of the Russian Federation, the inscription in a semicircle "РОССИЙСКАЯ ФЕДЕРАЦИЯ" (Russian Federation). 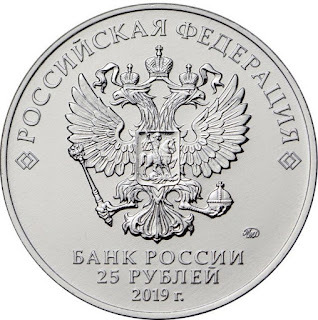 Below the inscriptions in three lines: "БАНК РОССИИ" (Bank of Russia), the value of the currency "25 РУБЛЕЙ" (25 RUBLES), the year of issue "2019". The mint mark is shown on the right.